Let me introduce you to Tristan (popular name these days) Wrench, your typical teen who has completed his schooling and has taken a gap year to figure out whats next in his life. He’s into parkour, drama and has done some great video editing for us in the past. To help him fill his gap year we arranged for him to attend an Intermediate Photography Course at Vega. First things first though, we needed a camera and on a tight budget we thought we would look second hand. KAMERAZ held the answer. It’s a sad thing in a way that with the growth of digital photography cameras good cameras that are getting a little dated are being less and less loved. Truth be told is that many of these cameras are still very capable. A visit to KAMERAZ, our local new and used camera store provided a number of options starting from as little as R2500.00. The benefit of purchasing from a dealer like KAMERAZ is that the cameras get tested before they are bought or traded in and when you purchase them they will come with a warranty. 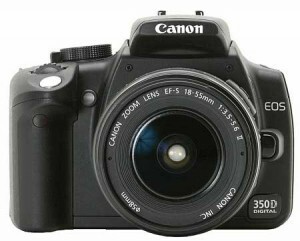 We picked up a Canon EOS 350D with 18-55mm lens for R2500.00, which despite showing the odd mark of use was still in great working order. This is the ideal kind of camera, capable and cost effective, just in case the bug does not bite enough to warrant a more expensive buy. Tristan’s course kicked off this past Saturday. Each week he will be checking in with us and sharing his experiences from that weeks lesson. At the end of his course we will share his images and experiences in an article in PhotoComment magazine. Vega is offering a course at each of their campuses in Johannesburg, Pretoria, Durban and Cape Town by entering the competition right here on PhotoComment.